BaitRageous: Does Santa fish on Reindeer Lake? 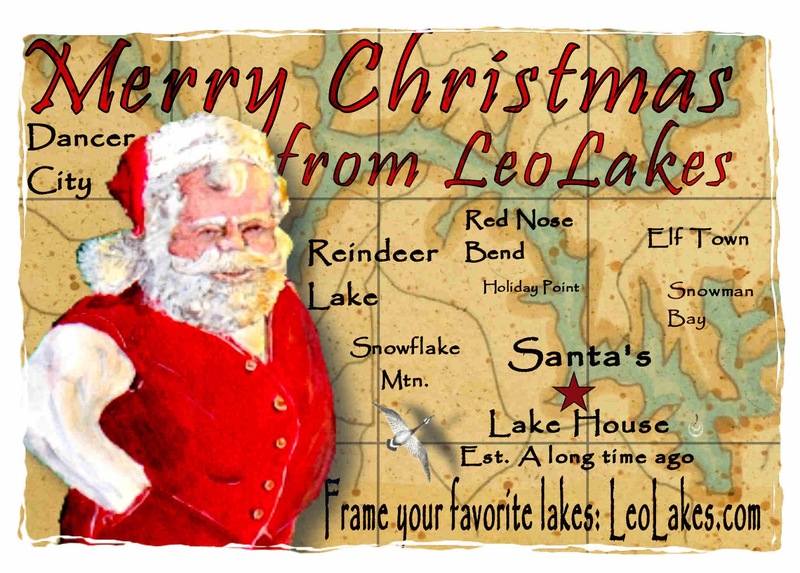 YES, SANTA'S LAKE HOUSE is on Reindeer Lake! It's a little too soon for Christmas ads, but I've been painting a new Christmas Ad for my website LeoLakes.com to use during the holiday season. The idea is based on Santa having a lake house. Obviously, Santa stays at his lake house for relaxation during his off times and does a little fishing. To add a little more creativity to the idea, I named a few of the surroundings on the map. Of course, it's in the vintage style, such as my maps, and a feeling of the 1930s cola ads. Let me know what you think! Oh yeah, check-out my vintage style maps for the lake house. If you have a special Lake, River or Bay, then paddle over to my website at LeoLakes.com. Remember: " Get away from the big screen and get on a big stream, if not, then at least put on the wall." Frame your Favorite, Lake, River, or Bay, LeoLakes.com.